All of the folders and files in question have also acquired “waiting to upload” tags. Altering or moving the files results in them briefly appearing to start uploading again, only to revert right back to the way they were before. Any and all help is appreciated. I’m running High Sierra on a 2014 MacBook Air, and my Internet speed should be able to handle the upload just fine. 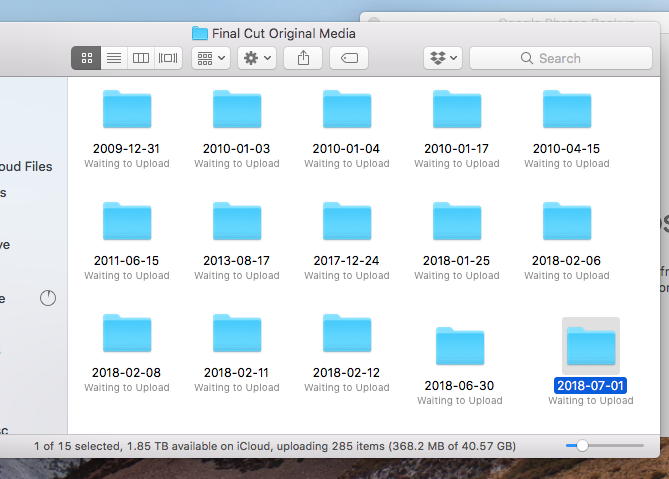 How can I get these files to upload to the cloud and offload them from my hard drive? Thankfully, there’s an app to figure out exactly which files are uploading, which are set and which are failing / out of date with iCLoud. Even better, it’s well described and actively being developed and I believe, free to use. Keep in mind that there are throttles to pause uploads after so many GB a day so your initial ingest might take a while if you just dumped a ton of data and are not leaving your Mac on and not sleeping overnight or over a period of several days. I would consider reducing the initial upload to 3 GB or so and let that catch up if you can at this point. Not the answer you're looking for? Browse other questions tagged icloud data-transfer . Second chance at icloud upload?